All Successful Little Minds Must Be Taught From An Early Age. Which Is Why Education And Nurturing Children’s Imagination And Creativity Is Very Important To Us At Cheeky Little Events! Education is very important to us at Cheeky Little Events, and even though we incorporate some educational entertainment into our parties… we want to incorporate some of our cheeky educational fun into schools. 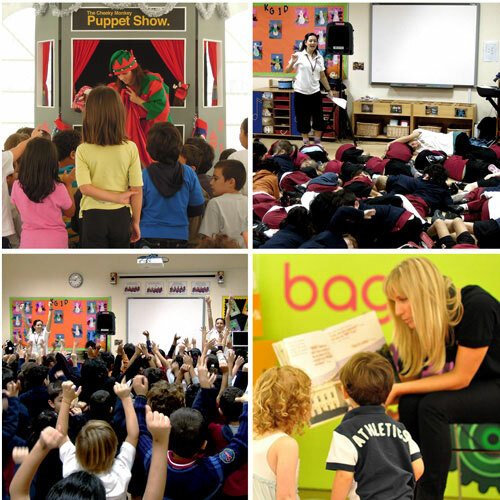 We offer unique interactive storytelling workshops and creative interactive puppet shows that can fit in well with current teaching programs and syllabus’s. We are all Professional entertainers from Dance and Drama backgrounds and have all taught children creatively as part of our careers! Thats not to mention the amount of parties we do!!! Its exciting to have guests into the school, especially when its fun and educational… the children will experience a different approach than what they are used to in the classroom… and the classroom teachers and assistants are able to join in and receive a cheeky school pack to continue the fun in between classes. We welcome the children into the space with a soft approach to encourage and inspire their imagination’s. Hearing and retelling traditional tales can provide scaffolding for children’s own imaginative stories, giving the child a variety of frameworks to work from and encouraging a questioning attitude.